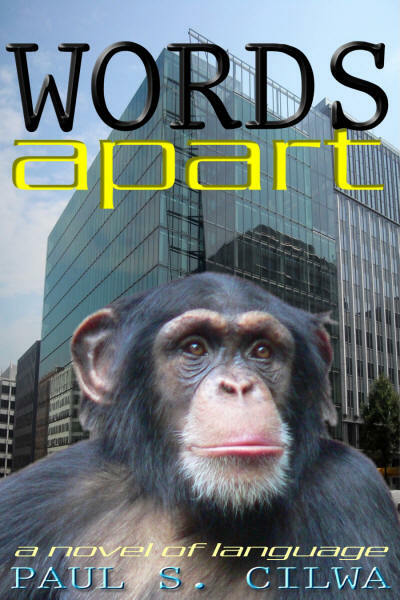 Cover and front pages of &apos;Words Apart&apos;: A Novel of Language and what makes us human. How I came to write Words Apart. Writing a novel constitutes a lot of hard work. Starting a novel is even tougher, because the writer anticipates all that work coming up ahead. It can be even more difficult if the previous novel hasn&apos;t yet sold. Still…a writer must write, and I&apos;ve had a story I&apos;ve been waiting to tell for the last 14 years. It&apos;s about a Deaf lawyer and a chimp that have learned sign language, and how the two of them together come to learn the true meaning of humanity. Chapter 1 of &apos;Words Apart&apos;: A Novel of Language and what makes us human. Chapter 3 of &apos;Words Apart&apos;: A Novel of Language and what makes us human. Chapter 4 of &apos;Words Apart&apos;: A Novel of Language and what makes us human. Chapter 5 of &apos;Words Apart&apos;: A Novel of Language and what makes us human. Chapter 6 of &apos;Words Apart&apos;: A Novel of Language and what makes us human. Chapter 7 of &apos;Words Apart&apos;: A Novel of Language and what makes us human. Chapter 8 of &apos;Words Apart&apos;: A Novel of Language and what makes us human. Chapter 9 of &apos;Words Apart&apos;: A Novel of Language and what makes us human. Chapter 10 of &apos;Words Apart&apos;: A Novel of Language and what makes us human.